Engaging biography of a pioneer in U.S. civil rights history, as well as the fascinating history of an era and a place (Washington, D.C.). EBONY EDITOR'S PICK, JUICY EDITOR'S PICK: "Powerhouse novel"
"Mama's Child is a deeply felt novel of a daughter on a quest for selfhood and a mother striving to come back to her own. Through alternating perspectives, Lester sensitively illuminates the challenges of living in a world still viewed through the filter of race...reminiscent of Alix Kates Shulman's Burning Questions (1978) in terms of a woman's consciousness awakening through a historic social movement." Booklist. "Lester conjures a credible plot and complications; divorce is a fact of life and racially mixed heritage is conspicuously becoming one. The simple contrapuntal narrative of Sarah Armstrong's escaping slavery distinguishes the book emotionally and psychologically, raising it above other issue-oriented Young Adult novels. Lester writes with social sensitivity and an ear for teen language and concerns. This is engaging treatment of a challenging subject that comes with little precedent." "The tenderness and truth of your book moved my heart. As well as the enormous love you have." "Joan Lester knows how to get inside a girl's head. Nina feels like someone you know or really want to know. Readers will cheer her one as she faces the fundamental question of who she is and who she wants to be." -- Marissa Moss, author of the bestselling Amelia's Notebook series. 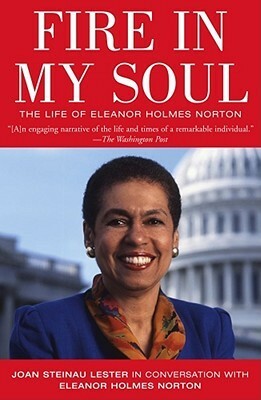 FIRE IN MY SOUL: ELEANOR HOLMES NORTON (Simon & Schuster)Foreword by Coretta Scott King. Tells the remarkable story of Congresswoman Eleanor Holmes Norton: civil rights activist, hard-driving legislator, cutting-edge thinker. Best-seller offers proven strategies. Lester urges women to believe there are practical ways to confront even the most stubborn roadblocks. "Peppered with humorous, helpful anecdotes, provides a lively jump-start to goal-setting." Ms. THE FUTURE OF WHITE MEN and Other Diversity Dilemmas. This ground-breaking book provides a refreshing look at diversity. Every day we are confronted with new dilemmas--at the office or in our neighborhoods. Most of us are well intentioned; we try to keep abreast of rapidly evolving values and do our best not to offend. Yet the rules are constantly changing.